Buy 2019 American Silver Eagles at low prices from Universal Coin, your trusted leader in bullion coin investments. American Silver Eagles are one of the most popular bullion coins in the world, containing 1 Troy ounce of pure .999-fine silver. Their weight, content, and purity are guaranteed by the United States government. When you buy 2019 American Silver Eagles from Universal Coin, rest assured they have been acquired by national award-winning dealer Dr. Michael Fuljenz and his highly trained numismatic team. Longtime consultant to Universal Coin, Dr. Fuljenz boasts more than 40 years of experience in grading and authenticating United States silver and gold coins. He has also won more than 60 prestigious awards from numerous numismatic organizations and consumer protection groups. Every coin you buy from Universal Coin comes with a 100% satisfaction guarantee. We ship our orders in discreet, secure packaging, and all online orders over $99 are delivered free. Additionally, we offer 24/7 customer care and will be glad to answer any questions you may have about your coins. Would you expect anything less from a trusted industry leader that has proudly earned and maintained an A+ rating from the Better Business Bureau? 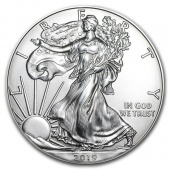 Buy your 2019 American Silver Eagles from Universal Coin for expert quality assurance and real peace of mind. Call an account representative today toll-free at 800-822-4653. To buy 2019 American Silver Eagles for your portfolio, call us toll-free at 800-822-4653 and speak to an account representative. Act now, before prices increase. Don’t forget to ask about our other popular silver and gold coins, including Gold American Eagles, Carson City Morgan silver dollars, Royal Canadian Mint Maple Leaf silver and gold coins, Perth Mint silver coins, and much more.